This week's Tool Time Tuesday is an easy one. We've had a crazy week around here, so I hope you don't mind this quick tip. I bought this large package of that rug grippy stuff. You know the thin rubbery material you place under an area rug so it won't slip. Well, I never used it. What to do with a very large package??? 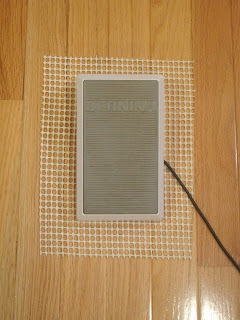 Place a piece under your sewing machine foot pedal to prevent it slipping away from you as you sew. 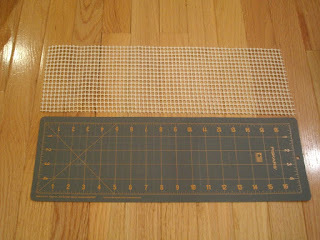 This works great for hardwood floors, tile, vinyl and even in my sewing room where there is carpet. I have one the plastic mats that you place under the rolling chairs. My pedal ends up on that mat and always slips away...but not now!! 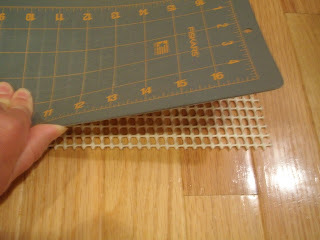 Cut a piece to fit the size of your rotary cutting mat. This will help keep it in place and not slide across your cutting table. You know those little grippers you can buy and adhere to the back of your ruler so it won't slip? Well, how about using a little piece of this grippy fabric. 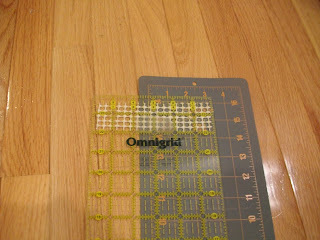 You could use double sided tape or a small dot of hot glue to adhere it to the ruler. I used a strip across the top and bottom, but you could place 4 little squares in each corner. How about using a square to help you get a grip on those hard to open jars!!! It works great. I cut mine in a square, but you can make hearts or circles. For all of you who love to do canning with all the fruits and veggies this summer...wouldn't it be cute to cut the grippy fabric into cute shapes and add it to a jar of your famous homemade jam when you give it as a gift. That way it will be easy for them to get into the jar of yummy jam or jelly. 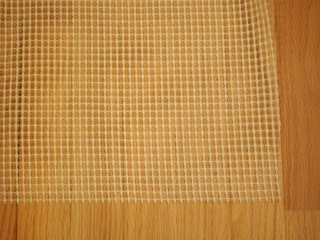 This rug backing is similar to the shelf liner with the same rubbery feel. You can find that in the kitchen section and some places already sell them in pre cut pieces. I'm sure there are so many other uses for this other than under your rug or in your kitchen cupboards, so I'll keep thinking. Sorry for venting all that, but I know you can relate. We all have one of those weeks once in a while. I just hope I can get back to regular blogging soon. That tip is great!! My elderly mother lives with me and is always calling me in the kitchen to open a jar for her. And it just so happens I have some of that at the house. Thanks. That "rug stuff" is fantastic! You really show some great uses for it. Thanks. I sure hope your week gets better. Lots going on and I certainly can relate. When I saw this I thought, "Now why didn't I think of that?" I especially love the jar opener idea. I'm going to do that. Well it didn't take but a minute of reading your intro before signing up with your blogs, grin, since a description of you fits a description of me, what's not to like, grin. Karen...thanks for the tip. My mom and I went to a garage sale a couple of weekends ago where a lady was selling some home crafted stuff. 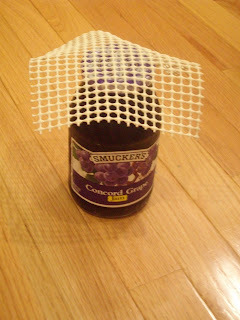 She had used the shelf liner to make a jar opener and then crocheted around the edge. So cute and what a good idea! I bought one for my mom. I appreciate the quick tool time because it always gets me thinking outside of the box. I hope your hectic week/schedule slows down a bit. 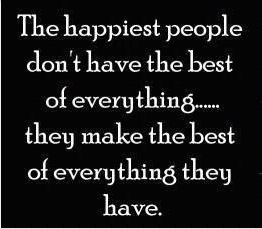 Sometimes life is just like that! Lots of good ideas! Hope you're enjoying a calmer week! Take a deep breath, Karen. Things will get back to 'normal' soon enough. And love your idea of using the grip. I can see this on the bottom of our foot pedal for our keyboard, too. thanks for all the tips! 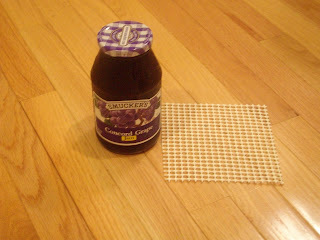 i have a bunch of this stuff at home and i never thought about using it with my sewing machine petal! I have some grippy liner under my serger to quiet down the shaking when I use it. Of course it makes a great shelf liner, esp for glasses of all kinds. Its great in the camper so things don't shift in transit, and if I wasn't so tired tonight I'd have other ways I've used it too. 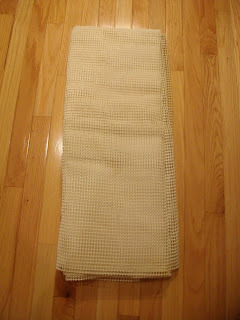 I have used it on the bottoms of bath mats and little kids slippers too. You can put it through the washer and you can sew through it. I have never put mine in the dryer though, just line dry whatever the item is. Hoping you have a quiet week and weekend. Gosh you simply do have the very best ideas!! Congrats to you all and Courtney on her graduation... a proud Mum you are! Enjoy your sewing when you get to it.